How Much Does It Cost To Raise Meat Chickens? 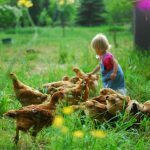 How much is chicken feed? 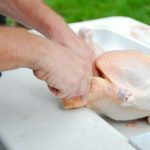 How much does chicken meat cost when you raise your own? Find out how much it will cost to raise broiler meat chickens. We’ve been raising meat chickens for several years now. Every year we learn something new and seem to generally be improving our system. But if we don’t keep good homesteading records to know the cost of raising meat chickens, how can we be sure we’re really doing it right? We love raising the Freedom Ranger meat chickens (or whatever you want to call them) in particular. We love watching our future roast chicken running around eating what it was created to eat- bugs, grass, weeds, grain. There is a discernible difference in eggs from chickens raised this way versus mostly all-grain fed and living in a coop/run situation. The yolks are literally orange! So it’s quite reasonable to believe the same improved nutritional quality will also be found in the meat of chickens raised that way as well. Granted our predator load is pretty low here. We’ve maybe had one problem since moving… and that might have been our dog, we’re not sure. And after the first few weeks of age, the predator threat during the daytime is virtually nonexistent. Were we in a different situation, then I’m sure we wouldn’t be letting them run around where they please. After all, it doesn’t do any good to raise the chicken to save a few bucks on the chicken feed by allowing them to forage for the most diverse and nutritious of food if they’re just going to go and get themselves killed while doing it. So don’t mistake me for telling you it has to be done this way or even with this breed. It has its drawbacks to be sure. (Takes longer to raise them up for one…) I’m just saying that after conducting trials comparing them from start all the way down to the roasting pan finish, these guys are our fave. We did two batches of Rangers this year. Butchering meat chickens is anything buy pleasant work and by the time we’re through about 50 or so, we… and I suppose I should clarify and remind you, I play Baby Card and care for the little ones and make sure the butchering crew is fed… are ready to be done. There was only a couple week overlap between the batches of birds so we were raising meat chickens from early May through mid-November. Next year, we’ll overlap a bit more since an early season snow storm and cold snap had these great grown bird huddling like little chicks all over again and we lost one just days outside butchering. What did us in loss-wise this year was a different cold snap in August. I’m sorry, I guess I haven’t been in tune to the weather long enough to have realized it was even possible to get that cold overnight in August! Well, it did and we lost a bunch in a huddle. Our second batch of 75 chicks was nearly fully feathered and so we hadn’t been keeping the light on. The barn had been heating up enough to stay warm overnight. Then the next night, the brooder lamp blew out and even more were lost! So.frustrating!! Harvested Meat: 353 lbs. 9 oz. Average Price Per Pound: $2.70/lb. Cost of Local, Ranged Broiler: $3.49/lb. 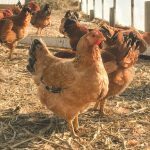 One-time purchases to raise broiler chickens, such as brooder, lighting, feeder & water, shelter, and butchering supplies are not factored into the cost of these birds. I only add in new materials that need to be purchased for each batch. If this is your first year raising chickens for meat, your costs will most likely be higher. But don’t let that stop or discourage you! Your costs should go down next year! We butcher our own meat chickens at home. And there are at least 7 good reasons why we go through all that extra work to butcher our own meat. How did we stack up against other years? Thank you so much for sharing your detailed stats! So very helpful. My husband and I are starting to raise livestock this year, and are planning on doing so with meat birds, as we have to travel in the winter so are not comfortable getting layers. May I ask what brand of feed you use? Happy New Year! Hi Kat! It’s so good to hear from you again! I hope you guys are doing well! Congratulations on getting your first livestock- what an exciting step! We buy our feed from a local Amish mill that has a non-GMO line. They deliver to our door for only $5 😀 Now before that we were using another brand- Hiland Naturals- who also has a non-gmo & organic feeds. We were very pleased with their feeds and only stopped using them because their location moved further away. Take care!! I finished doing the statistics for my meat chickens this morning, and while we did not raise any where near the number of birds that you did, I was pretty pleased with the results. Our birds averaged 4 lbs. and cost us $2.02 per pound. Considering organic chicken in my area is $7.99 per pound that’s a HUGE savings! Unfortunately, I do not believe I will be raising more this year. For some reason, I grew really attached to the little guys (which I have never done before!) and butchering took a major emotional toll on me. Yeah, it certainly isn’t an easy thing to do, for sure! I’m glad you were able to get such a great cost savings!! That’s awesome! Thanks for sharing! We are raising birds for eggs, but plan to cull them, probably next year, if it works out well. Do you recommend raising meat birds alongside layers in a small flock? Or do they not work well together? Hi Abigail! They do perfectly fine together! The only way I would discourage it is if you bought partially grown birds from a different farm because of disease, but with baby chicks it’s no problem at all! Hello Quinn, I hope this isn’t an obvious question, but…what did you do with the birds that were killed? Were they too far from the butchering date to be usable or are you able to salvage any of it? Sorry Quinn this isn’t clear in the article…did you save $279 after you accounted for the cost of $956 that you put into the birds? Or would we do 956-279 to find out what you really spent on them? Does that make sense? It would be helpful for readers if you could clarify that by maybe adding up the second part and subtracting the savings from what was spent or vice versa. Thank you! And ditto what vck said – organic or even just slightly natural chicken costs at least $5/lb probably more where I am. So wow savings! I figured what we paid for the whole chickens when they were all done and ready for the freezer (956) and figured the price per pound off of that. Then I took the harvested meat poundage total and multiplied it by the 3.49 just like we were going to go buy it from the farmer. Then subtracted the 956 from that number. Hope that helps! I always love reading this kind of post from you. You are honest and I feel like there is a lack of that. So many tell you it’s either VERY expensive or pretty much FREE. Thank you Pia 🙂 I do know this much from all these years of doing it, for the most part, chicken farmers (doing it the way would) aren’t asking nearly enough for their birds. Bill keeps hinting that he thinks we could do meat chickens for sale next year, but in our area there is no way we would have a market for that. In fact, I’ve heard one Amish neighbor say that he won’t shop at the little Amish-owned bulk foods grocery store here in the neighborhood because he can get the same things for *cents* cheaper at walmart 30 minutes away! Now if they’re aren’t going to support each other, we haven’t a chance! It’s such a shame! We raised a small batch of meat chickens this past summer and plan to again in later spring. It really is a very rewarding experience. We also just got our very first dairy cow who is hopefully due to calve soon! I have not been able to find any non gmo feed options other than online so shipping doubles the price :(. We have several in our family of 8 that have celiac so we are mixing a gluten free feed for our layers and cow but may be cost prohibitive for meat birds, not sure yet. Just wanted to say I love all your post. And a question…Where do you get your freedom rangers? You’re right Cassandra, it is. We’ve had better years with losses & worse. I think the cost per pound would have been better only slightly because they were still so young. It hurts a lot worse to lose them after the brooding stage (which is extremely rare unless you have a serious predator problem- which we have before, but not this year) because there is less feed costs invested in them at that point. You’re basically out the buck or two per chick. It’s been my experience though that no matter how hard you try, there is always something that pops up and keeps us from 100% survival rate. Among the reasons why I love this breed is because I can be fairly certain that health & genetic disease won’t be one of them. Thanks we are just learning and in the next couple of yrs we will have our own land. I appreciate all the info you give. We have raised several different breeds and truly prefer the freedom rangers. This year we are using them for meat AND layers. By default, we saved a few back from butchering this fall and the few hens we had..(a neighbor’s St. Bernard came in a month ago and ate them)..were laying the most beautiful double yolkers!!! We are hooked on this breed. I agree with Quinn….financially, it works! They do give you the most bang for your buck with those eggs, don’t they? Thanks for sharing your experience with the Rangers Dianne! They’re the best! Great post, thanks. I would like to get more info from you regarding your feed and your free ranging approach. 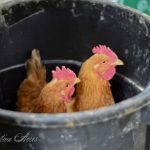 Do you let your chickens free range all over your farm? What about parasite issues with your livestock, are you able to keep them away from your barnyard? And is your feed just a supplement and your chickens are mostly feeding themselves off the pasture. I’d love to figure this out as buying feed seems nutz to me. I’m sure our grandparents weren’t doing it. What variety do you have for your layers? 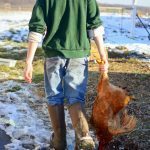 Hi Kate, I did this post earlier in the year about how we move them through the pasture (and why we don’t exclusively free- range them anymore). At this point, we supplement with only whatever they can find (which works great for our layers who we don’t feed AT ALL during the warmer months of April to October. I’m planning a post of how I intend to integrate various perennial plants & shrubs into our landscape that will help with the feed bill. But I agree, it seems silly to feed a ration if you don’t have to & can get a more nutrient dense egg/meat without it. Were you feeding organic feed? No we were not. It was non-GMO however. Financially, that's the compromise we've had to make in order to make it feasible. I would guess organic feeds to be a third to double the price.